Early Bird Discount: SAVE $25 before May 1st! Register now to ensure your place in our limited Summer 2019 program. WEEK 1: July 15-19 ($325) ONLY $300 BEFORE MAY 1st! Learn the Fundamentals of Basketball all in a Fun and Safe Environment! 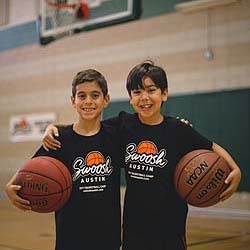 Introducing Swoosh Austin - a brand new and exciting way for kids to experience the thrill of real basketball and learn the lessons that go along with being a good player, and a great sport. Now in its fourth year, our exclusive 1- week summer basketball camp program is designed especially for kids entering grades 3-8. Head Coach Matt Calabro and his staff bring to Austin this summer a combined 30+ years of basketball experience teaching and coaching kids in a real, hands-on clinic. 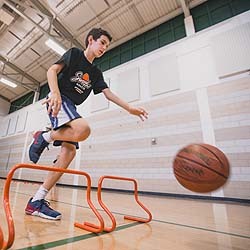 This indoor basketball camp, located at West Ridge Middle School, will runs for 5 days from July 15-19, 2019. From passing, shooting and dribbling to real set plays and tournament competitions, kids will learn how to play the game from teachers who actually played the game - and they'll have a blast doing it!